Speak It Louder: Asian Americans Making Music documents the variety of musics-from traditional Asian through jazz, classical, and pop-that have been created by Asian Americans. 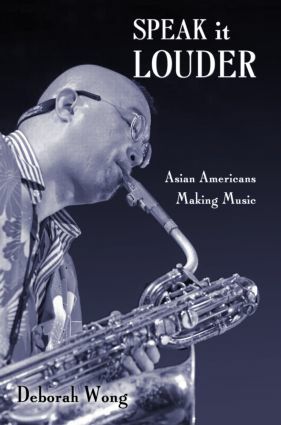 This book is not about "Asian American music" but rather about Asian Americans making music. This key distinction allows the author to track a wide range of musical genres. Wong covers an astonishing variety of music, ethnically as well as stylistically: Laotian song, Cambodian music drama, karaoke, Vietnamese pop, Japanese American taiko, Asian American hip hop, and panethnic Asian American improvisational music (encompassing jazz and avant-garde classical styles). In Wong's hands these diverse styles coalesce brilliantly around a coherent and consistent set of questions about what it means for Asian Americans to make music in environments of inter-ethnic contact, about the role of performativity in shaping social identities, and about the ways in which commercially and technologically mediated cultural production and reception transform individual perceptions of time, space, and society. Speak It Louder: Asian Americans Making Music encompasses ethnomusicology, oral history, Asian American studies, and cultural performance studies. It promises to set a new standard for writing in these fields, and will raise new questions for scholars to tackle for many years to come.